Canadian startup Girfalco on Friday unveiled a thinly-veiled concept for a new three-wheel electric sports car that promises to be one of the quickest-accelerating cars money can buy. Called the Azkarra, the two-seat electric three-wheeler is designed for both road and track use and in its most potent form hits 60 mph from rest in just 2.5 seconds. We’re talking hypercar territory. Girfalco will offer both a standard Azkarra and sportier Azkarra S. The latter benefits from an innovative three-wheel-drive system consisting of an electric motor powering each wheel. The motors enable full torque vectoring and a combined continuous output of 217 horsepower (301 hp peak). In addition to the 2.5-second 0-60 time, the Azkarra S also easily hits a governed top speed of 150 mph. The standard Azkarra has a single motor but it’s still no slouch. It has a continuous output of 72 hp (100 hp peak) and will accelerate to 60 mph in 4.5 seconds. And its top speed is 124 mph. Both models feature a direct-drive connection between the motor(s) and wheels. No details on the battery have been released but Girfalco says owners can expect a range of approximately 124 miles, though this will depend heavily on driving style. 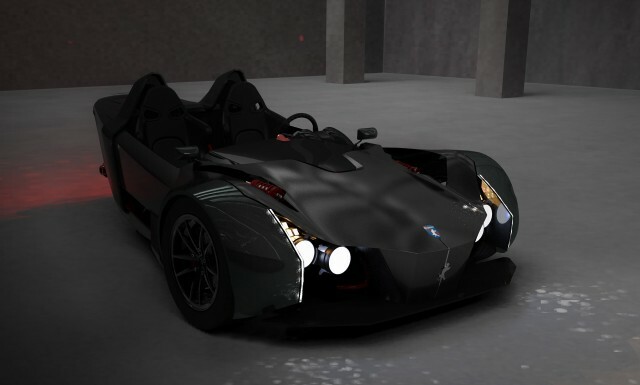 Because of a bigger battery and extra motors, the Azkarra S weighs 1,124 pounds. The standard Azkarra tips the scales at 1,058 lb. While Girfalco envisages owners mostly using the Azkarra as a weekend track toy, the company understands that some owners will want to take the car on the road. Girfalco says it will offer a number of modcons including leather trim, a suede-lined steering wheel with contrast stitching, and a Kenwood sound system. There’s no roof for the Azkarra so this may limit its usability. There will also be numerous personalization options. For example, owners will be able to choose various wheel patterns, color schemes and seat trim. There will also be special edition models, some of which will highlight national racing colors. Girfalco, based in Boucherville, Québec, will start deliveries in the spring of 2017. The company plans to limit production to just 100 units and estimates a build rate of 25 cars per year. The estimated starting price is a little over $50,000. If you’re interested, Girfalco will start taking pre-orders in January.